Call of Duty: WWII Review With Initial Impressions — GamingWithSwag.com - Dads By Day, Gamers By Night. Multiplayer provides a wealth of content this year, including a fully interactive third-person headquarters. The king of retail AAA releases makes its annual holiday return in the form of Call of Duty: WWII. This year’s installment brings an overall welcome return to the Word War II setting, along with an innovative multiplayer experience and cinematic campaign. In addition, we get to see Sledgehammers first stab at a mainstream Zombies mode for their game, which sees the return of “Nazi Zombies”, a throwback to the original World at War mode. 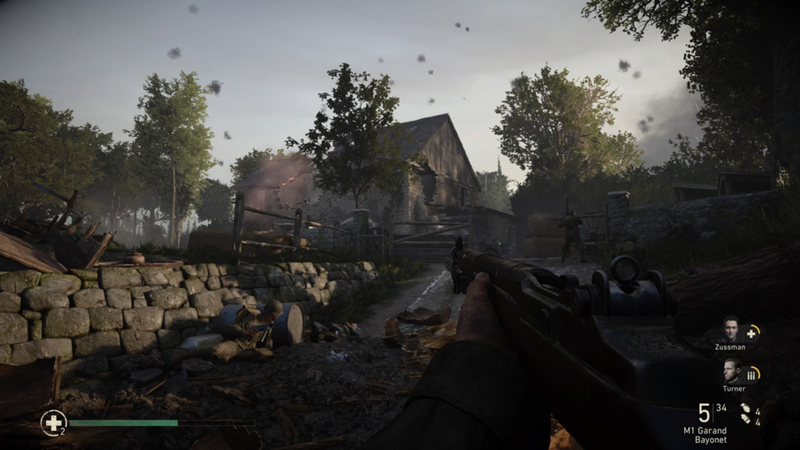 Longtime fans (and the hardest critics) of the series will be delighted to find that Sledgehammer has expanded on the multiplayer experience by creating a 3rd person virtual hub called “Headquarters”. In this area, players will have the opportunity to tinker with all things outside of multiplayer matches, including prestige classes & weapons, open supply drops, visit the Quartermaster, and take on daily & weekly orders. There’s even a few extra bells & whistles thrown into the Headquarters, making it the most social release in the series to date. The campaign, while often regarded as the most under-appreciated portion of each annual release, tells one of the most powerful stories to date, bringing the second World War setting to life like never before. Utilizing the power of this generation of hardware, Sledgehammer brings their story to life in an almost cinematic-like form, as nothing is held back when it comes to raw details. Gone is the regenerating health system, as health packs make a surprising return this year for the first time in over a decade. This years campaign is quite possibly the best told WWII story ever told in a video game. Nazi Zombies makes a triumphant return, bringing with it a map that is far more sophisticated than its World at War predecessor. All of the fanfare players have come to expect over the years is here, in addition to a few terrifying surprises that separate itself from the original. Sledgehammer has opted for a more serious tone for their Zombies mode, when compared to last year’s excellent Zombies in Spaceland. They have also mentioned that their Nazi Zombies will contain the most difficult to obtain Easter Egg to date. This year’s Call of Duty contains the full package, innovating in ways that aim to please those who feel the series has seen better days. As their second attempt at a mainstream Call of Duty title, Sledgehammer packs a punch in all three modes, ranging from their social experiment within the multiplayer, through the deep campaign throwback, and all of the way to their terrifying Nazi Zombies. Call of Duty: WWII will not disappoint this year, as longtime fans of the series are in for a solid package this year, making this a must-play title this holiday. Nazi Zombies make a return after their original debut 10 years ago!